Does an event, any event, belong to the memory or to reality, as exists despite any individual or collective memory thereof? If we accept that any event enjoys an existence independent of any memory thereof, it would be impossible to reach the truth of that event, since all we have of any event is the collective of what remained thereof in human memory and its extensions. On the other hand, if we believe that the event exists only in memory, its diverse representations in individual memories would be equal in their credibility; since there is no original outside any memory that could be used as a reference to judge the truth or falseness of it. These speculations appear to floating in the realm of the theoretical, away from the facts and needs on the ground, where we always need to validate a specific story to adopt as the truth. This is a need without which we cannot perceive of our daily lives. It would not occur to any of us to question that a daily simple event is nothing more than our memory thereof. The memory of an event is the truth despite our conviction that the event itself exists independent of our memory. However, the lived reality may drive us to question this assumed and inevitable overlap between truth and memory. When stories regarding a certain event are multiple and sometimes contradictory, we have to look for an alternative but are faced with the reality that all we have is a heap of stories and memories. However, people’s rights and fates might be at stake and for that reason we cannot allow ourselves to remain within a space of philosophical questioning. If an event was nonexistent beyond memory, it should be subject to verification to arrive at objective criteria to address each story of the event. In that case we cannot claim that those objective criteria related to the event are the truth beyond any memory, but is more linked to the internal consistency of the memory, excluding contradictions and deliberate fabrication. This report, like our previous one concerning the Mohamed Mahmoud events, aims to collect memories to weave by themselves an objective matrix against which to test any recall of the events. 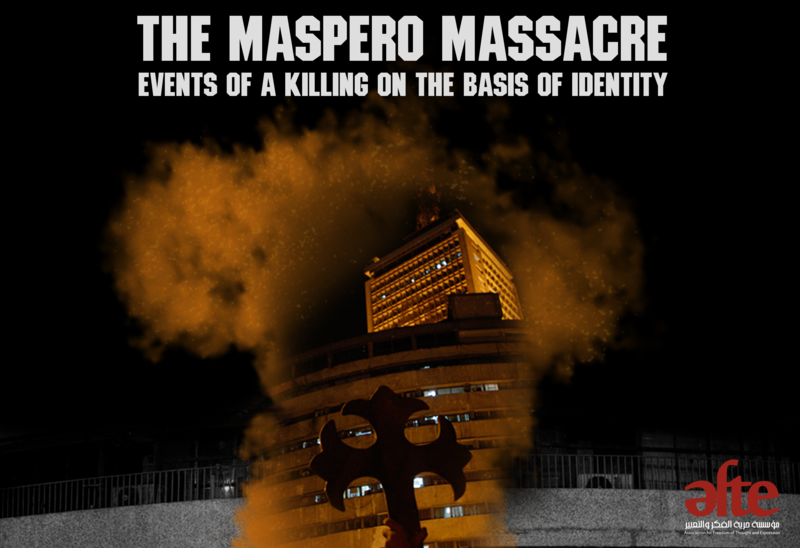 This time the event is what has come to be called “the Maspero events” in reference to the huge building by the Nile which hosts the most important media institution in Egypt, the Radio and Television Union, and which has witnessed the events on the evening of the 9th of October 2011, witnessed by the building and its cameras which broadcasted those events live to the homes of millions of Egyptians. Despite this live coverage the event was and remains surrounded by the grayness of doubt concerning the truth of what happened, a stark example that even what we see, either directly or through the camera is not enough to form a memory that we can take to represent the truth which we assume is independent thereof. What we know for sure regarding the event is its direct material consequences: the killed, the injured, the burnt vehicles (military and civilian), the empty cartouches of the fired bullets etc. Other than that, the interpretation of that material outcome is disputed by contradictory stories, some of which have reached official documents, while others have been repeated and published by media channels to create an important collective memory. Others remain held in the memories of those who have survived the event. Official documents, authorities’ reports, investigation reports, minutes of court sessions, all weaved the story upon which depended, or not, the criminal responsibility for the event. Political responsibility remained floating in a space of denial or falling upon this or that party depending on the legal moment. The story of those who lived through the event, on the other hand, did not have the chance to formulate their alternative stories in a way that would be effective on the ground. This aspect is what this report is trying to show although it was not able to solve it to the extent we wished. Collecting this memory exiled from official documents and media highlights, we seek for the alternative story to forge its space. Also, collecting those official documents and highlighting what it elected from the lived memory of the event might enable us to outline what is objective and in harmony with that memory, so that we can confidently try the rest for being fabrication, fraud and lies. Time does not deal in the same way with memories kept safe in the minds of its owners and those allowed access to papers, recordings and documentation. Thus, what finds its way from the realms of memory into what we call “history”, does not necessarily do justice to the memories that have been denied documentation. Investigating the substance of those memories is closely linked to questioning the authorities. The different representations of authority owns most tools of documentation. In most cases it is able to deny those alternative memories hoping for time to overshadow them. In a way our report, like the previous one, is trying to provide documentation for that alternative memory, using the few documentation tools that are not under state control, in the hope that they not be overlooked by history.